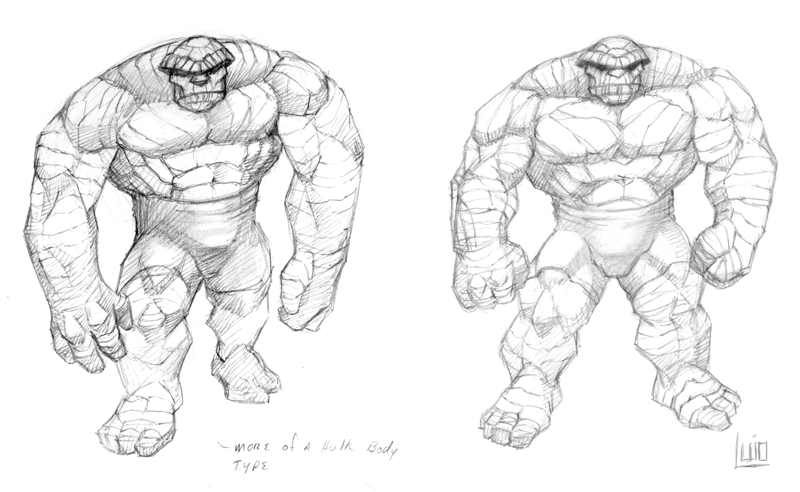 Been feeling the itch to do a super hero image or two, and I'm having trouble making up my mind on who to pick. There's just so many to choose from. Another problem is, I can't remember the last time I picked up a comic. Much as I still love the genre, I'm woefully out of touch with who's new, who got a make-over etc. I figure I'll go old school, and see what that brings. 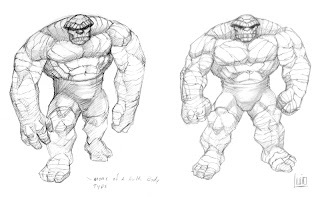 One of my possibles is good ol' Ben Grimm, aka The Thing...a rock solid choice I think. (pun very intended) Not much different in the overall appearance, though I decided to go with a layered sediment effect for his rocky appearance...like you'd see in the Grand Canyon walls or shale quarry, instead of the usual broken up chunks of rocks. Just sketches so far...still haven't decided who I'd like to paint...maybe Powergirl...mm!